I've never ever worn a single yellow attire as a sign of respect to my parents, with the exception of one occasion where I was duped into playing the part of cheese during a school performance. Needless to say, to this day I cringe whenever I hear the song "the farmer in the dell". Remember the part where "The Cheese stands alone"? You see, Foochows only wore yellow at their parents' funeral. During the grieving period, one will have to continue wearing a cut out piece of yellow cloth pinned to the sleeve. Traditionally, yellow is only reserved for the emperors. The same color adorns all the royal palaces, altars and temples in China. Now where is she going with all this philosophical ramblings, I hear you say. Lately, I've been rather attracted to yellow shoes. Something bright and cheerful which will work as a nice contrast to my somber winter garments. A package came by way of mytheresa.com. As you can tell, I'm still obsessed with K Jacques St Tropez flats. 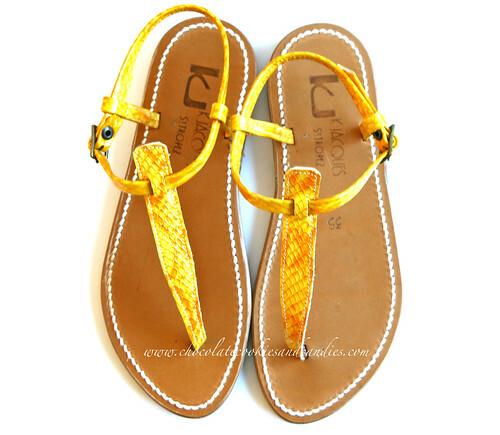 These are Picon flats with mock snake leather. I couldn't resist the 60% off discount and since I'm going to spend the next 6 weeks in sun-drenched countries, I'll be busy unearthing all my summer clothes hidden under piles of sweaters. These arrived recently as well. It was an apology from an online store for stuffing up my orders, coincidentally, a similar pair of Repetto flats for my mom. I never turn down free designer shoes! Last week, a friend of mine made me count the number of flats in my closet. At a quick guess, my collection hovers around 9-10 pairs. My excuse is I walk a lot hence a good pair of flats is vital. To preserve the longevity of my shoes, I need enough to rotate so that none of them wears out. Sounds like I'm making excuses for my shoe addiction. Update: My mother reminded me that yellow is the color of mourning for paternal grandparents. Li,yellow is the mourning color for the paternal grandparents .Not sure whether this is still practised nowadays. Very nice flats but did not quite expect yellow repetto shoes !! Thanks anyway . Oops sorry, Mi. I thought it was parents. You sure you NEED another pair, Mi?? I've shipped 3 pairs in a year to you. Not forgetting the Tod's that you took too.